Tonight is my perfect night in. My beautiful wife has had a ‘sugo’ cooking since mid afternoon and an old bottle of Isole e Olena Chianti Classico ready to drink for dinner. A good red sauce and an aged Chianti almost tops my list of the ‘perfect night in’. Yesterday was a scorching day in Melbourne. A top of 38 degrees Celsius with a minimum on 26 degrees. Not the ideal BBQ weather but with air conditioning the only hard part was the BBQ outside. We started off with some Champagne to begin with before moving onto Chilli Prawns and the 2011 Pewsey Vale Eden Valley Riesling. This is one of my favorite Rieslings: great when young but also ages an absolute treat. This wine was singing last night and was the perfect match to the prawns. I would have been happy to stop at that and just eat Prawns and drink Riesling all night. Next we moved onto some grilled Dory on the bbq match with some salads and in most instances the Riesling or aged Chardonnay (of if thinking Italian a bottle of Etna Bianco) would have worked well. 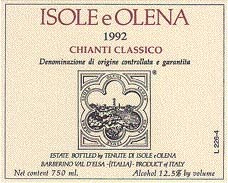 Instead we had an aged bottle of Isole e Olena Chianti Classico 2006. 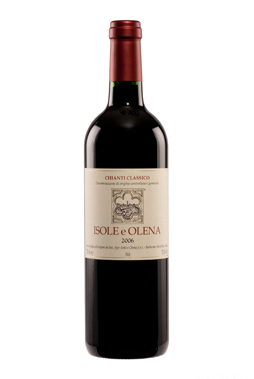 This is one of my favorite Chianti’s from the 2006 vintage and it was drinking true to form. It was also a perfect match to the fish. Whilst the fish was grilled, it still had some pretty strong flavors and the hint of age from the Chianti meant that they actually worked really well together. Fish and Chianti is not something I would normally match together, but on a hot Melbourne night, with the air conditioning on max, it worked out to be almost the PERFECT match. Sometimes I just crave comfort food and wine. Of course this can mean different things for different people. For some it might be a burger and a beer. For me, it is definately Porcini Risotto (cooked by my wife Kathryn) and a bottle of aged Chianti Classico. Tonight is the perfect weather for it. Whilst it has been a hot summer so far in Melbourne, today is cooler, and just perfect for some heartier food. I have cellared a lot of Felsina and Isole O Elena Chianti Classico over the last decade. 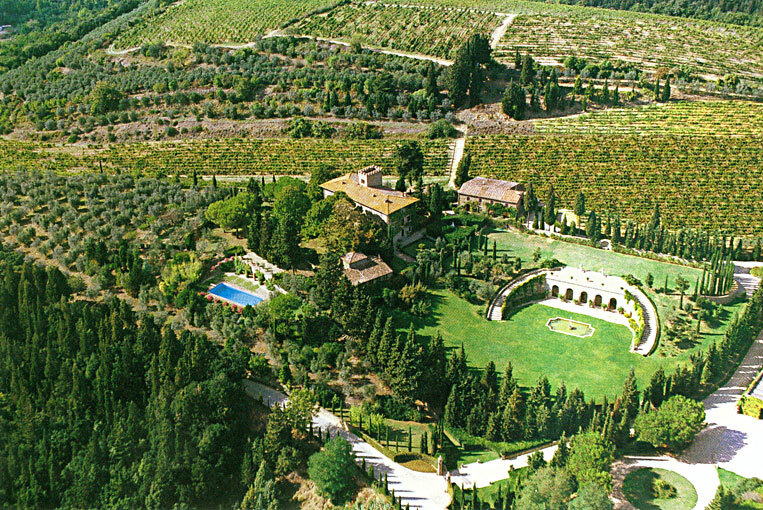 I have also put aside each vintage of Castello Monsanto Chianti Classico which I import and distribute around Australia. 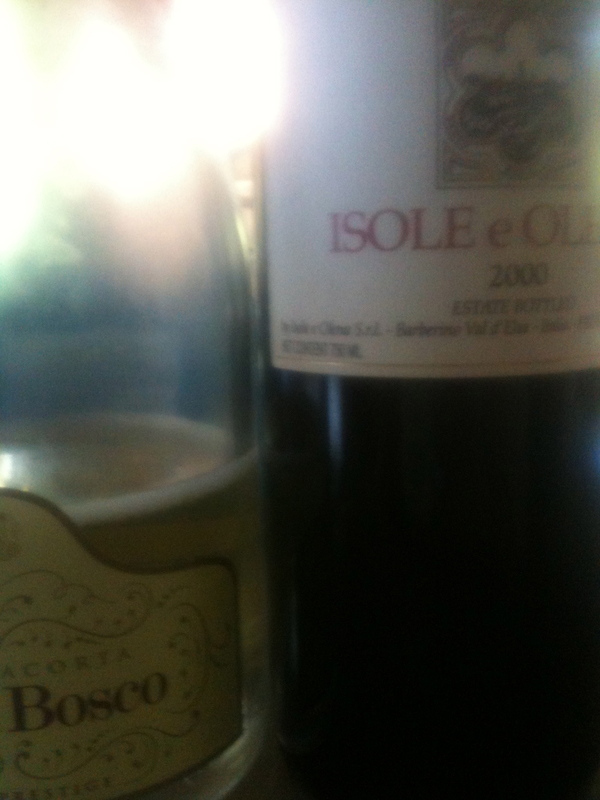 These three wineries, make up the bulk of Chianti in my cellar. For me, they are also three of the best producers of the style that are imported here. 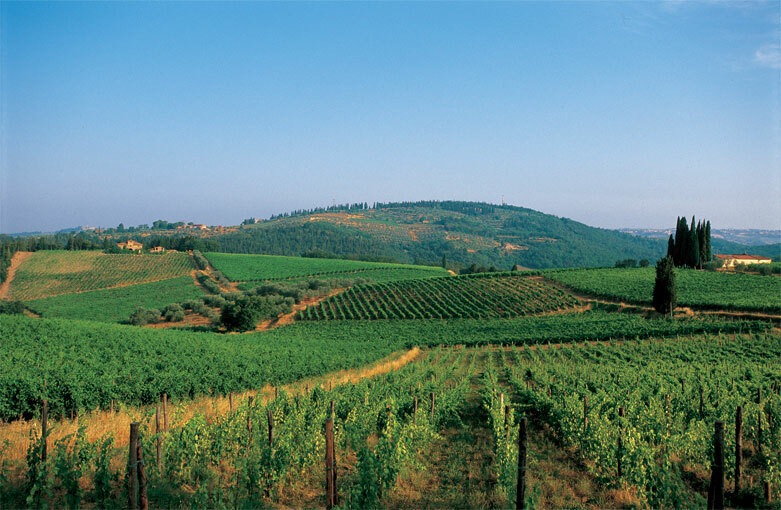 In Australia, the current vintage of Castello Monanto Chianti Classico is 2008. However, if you can always try and drink Chianti Classico with a bit of age. Even a year or two makes a big difference. Today at lunch I will go home and decant a bottle of 2006 Castello Monsanto Chianti Classo. This wine was a brute when it was young. A massive wall of tannin’s kept the fruit hidden for days. However like all things, age has mellowed it, with the tannin’s dropping and revealing a beautiful core of dark savory fruits. It is now entering it’s drinking window. I expect it to hold this line and length for many years to come. Hopefully I will have a little bit of Risotto and Chianti left over for a tasting note tomorrow. Most of the time we use the Jamie Oliver recipe and subsitute the butter for olive oil. 1.Soak the mushrooms in warm water for 30 minutes, drain and squeeze out any excess water. Reserve the drained water. 2.Heat the chicken stock in a pan to a very gentle simmer. 3.Heat the olive oil in a large pan. Fry the garlic and onion over a medium heat for 2-3 minutes. 4.Add the rice and coat with the olive oil, garlic and onion mix. Cook for 2 minutes. 5.Add the white wine and cook until the liquid is absorbed. Once absorbed, add a ladle of the simmering stock and cook until absorbed. Continue until all of the stock is absorbed. 6.Cook until the rice is just under âal denteâ, and then add a ladle of the reserved mushroom water, along with the porcini mushrooms, the knobs of butter and half of the parmesan cheese. 7.Cook until the liquid is absorbed and the risotto is cooked âal denteâ. Season with salt and pepper. 8.Serve with a sprinkle of parmesan. I love the 2007 vintage in Tuscany. I am a traditionalist at heart and the vintages that show exactly how a grape variety should look to me is the perfect vintage. Vintages like 2006 for Tuscany may be rated higher by many wine scribes around the world, but for me it shows Sangiovese at the riper end of the fruit spectrum. Whilst not as extreme as, say the 2003 vintage, 2006 has producers wines that are ripe, and many that are extracted and a tad dried out. On the other hand 2007 as produced many classic wines, that showcase the savoury characteristics and tannin profile of how serious Sangiovese should taste like. Furthermore, they will age an absolute treat. 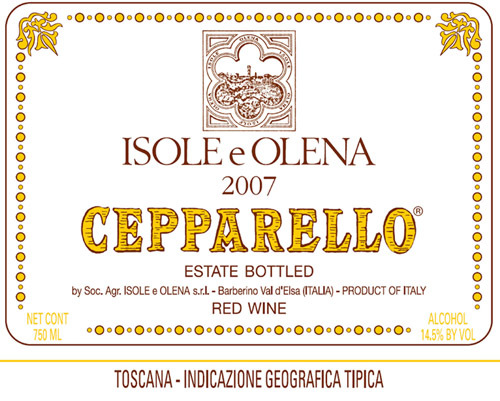 The 2007 Isole e Olena Cepparello first grabbed my attention at Vinitaly this year when I tasted it with Paolo di Marchi. It was seamless, well balanced and had loads of the typical Sangiovese complexity. Well finally this wine is available in Australia and it doesn’t disappoint. I had drunk it over three days and each day it has got better and better. On night one, it was tight, focused and gave nothing away. So much so, that after half a glass I put the screwcap back on (note is bottles under a IGT denomination so Paolo can use screwcap) and stuck it back into my wine cabinet. On night two, it had opened up beautifully and I had to stop myself from drinking the remainder of the bottle. It reminds me of a better version of the 2004 Cepparello and should age a treat. Tonight it has gone up another level and offers layers and layers of complexity with beautiful Sangiovese tannins and an intoxicating perfumed nose. Is this Tuscany’s best red? Well it would go close. However, I must make the point that there has been a slight move to make (intentional or otherwise) Cepparello a more modern style. For me it is still traditional in profile, but I would like to keep a lid on how far they have pushed it. Would it be an even better wine at 1% less alcohol (it is 14.5%)? Well maybe, but we can only judge what we have in the glass. I have tons of Chianti Classico in my cellar. Probably split 50:50 between Chianti Classico and Chianti Riserva. Normally I drink Chianti Classico aged in my cellar from 1-10 years and Chianti Riserva at 10-15 years. However I always leave a few bottles of Chianti Classico slip past ten years of age just to see how they will develop. Last night we started with a bottle of Ca’ Del Bosco Brut Prestige before moving onto a bottle of Isole e Olena Chianti Classico 2000. This bottle was superb. The tannins had melted away into the fruit and it was as balanced and harmonious as Chianti Classico can be. Sensation bottle and makes me want to stick more Chianti Classico in the cellar.